Having been warmly received by a crowd of nearly 19,000 in Detroit the week prior and speaking for two and a half hours, he had more to say and wanted to deliver the second part of his message March 2 in Chicago. “Chicago is a great city with some powerful and magnificent Black people in it, so I wanted to come and see you,” Min. 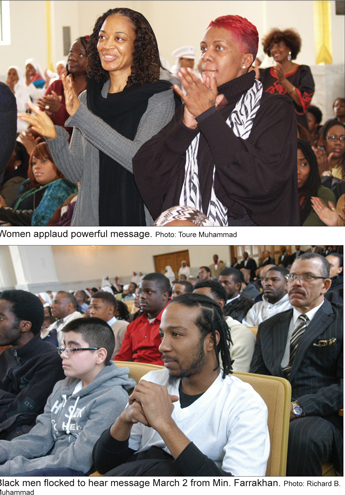 Farrakhan said. As he did the previous week, the Minister delved into the lives and thinking of many in the pantheon of historical Black leaders, who represented different points along the ideological spectrum of Black liberation. Over a century later, Blacks are still fighting to achieve freedom, justice, and equality—the desire of leaders from Frederick Douglass in the 1800s to Clarence 13X, founder of the Nation of Gods and Earths, and Min. Malcolm X, the Black nationalist icon of the 1960s. Black people have done all they could to be accepted by White society, but it has not mattered. 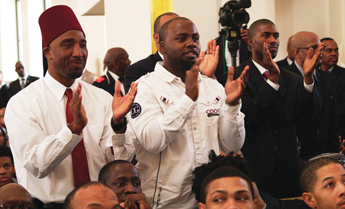 The time has now come for Black people—who are very valuable in the sight of God—to accept responsibility to build God’s kingdom on Earth, the Minister explained. Telescopes are peering way into space and no ‘heaven’ has been identified in the sky, though that is what Black people have been taught for generations through Christianity, he continued. ‘Heaven’ and ‘Hell’ are conditions of life, not an afterlife, said the Minister. As an example of the continued injustice Blacks have suffered in America, he spoke about “Stand Your Ground” laws, which are related to high-profile deaths in the case of Trayvon Martin and Jordan Davis. Both unarmed young Black teenagers were shot and killed by grown men who claimed to have felt threatened by the mere presence of the innocent young Black boys. The Minister asked what would happen if Black people began to claim “Stand Your Ground” defenses across the U.S. in their interaction with White people.